Webb: We are late with this post. My brother and niece were visiting, which means I basically took time off from both training and blogging. We did have the foresight though to plan this visit during a recovery week. 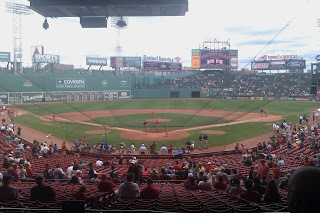 My training therefore amounted to walking around Boston doing tourist type stuff, including climbing the 294 steps to the top of the Bunker Hill monument and taking the niece to her first MLB game. There are few things better than an afternoon game at Fenway when the weather is nice. Even if you are not a baseball fan, it really is a treat. And with this being the 100th anniversary for both the state of Arizona (where they were visiting from) and Fenway, it really puts some of our history in context. Elle: This has been an ultra-recovery week with Webb's family in town. Not good, but maybe not so bad. But sometimes life happens when you're training, you deal with it and you move on. 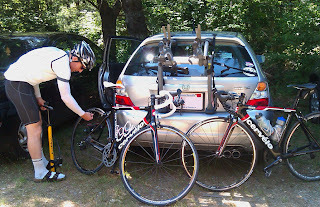 This past Sunday (before our week of sloth), we drove up to New Hampshire to do the Timberman bike course. Webb: The Timberman race site is about a 1 hour 45 minute drive from our apartment. Since we allowed ourselves about 4 hours to ride the 56 mile course, that meant we were looking at a minimum of a 9 hour day with driving, gearing up, actually riding and post-ride nutrition. Knowing all of this, we were still slow to get on the road. Elle: The ride up was kinda long but not terrible. [Webb interjection: Anything longer than 1 hour is a "long ride" for Elle.] We had to pay $5 per person to park. That was unfortunate since we weren't actually using the park. Most people park there to walk down to the lake's beachfront. We then saw two other later comers who parked just outside the gate and didn't have to pay. Note to self: do that next time! As we were getting ready to head out on our ride Webb realized he forgot to put a Garmin mount on his bike. D'oh! 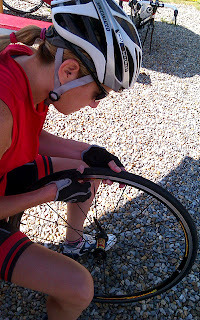 But I had mine mounted, and he decided to carry his Garmin in his back jersey pocket. Webb: Forgetting my bike mount (it is on the tri bike) was a rookie mistake. The whole point of doing the ride was to learn the race course. Having the Garmin was key so we could watch the odometer to know when to look for turns and hopefully memorize where the big climbs are. As it so happens, I made a much larger rookie mistake. Elle: Webb thought he printed out the bike course directions, but as I looked around the car, I realized that the bike course page wasn't with us - it had never printed out. Luckily, I had found some directions and printed them out last minute and laminated them. It was from someone's blog that I had found on a Google search that morning. So luckily we had that. But we would find out later that the directions were less than accurate. We headed out on the bikes and encountered a sizable hill, right out of the gate. Good to know! All of the big hills are at the beginning, and since it's basically an out and back course, you get them again at the end. The course is pretty enough. Lots of spots to stop and get ice cream. I was really surprised by the amount of motorcyclists riding around with no helmets. I even saw one guy with no helmet, no shirt, wearing flip flops. I had on more protective gear than this guy. One cool thing was cycling past the New Hampshire Motor Speedway. Webb: Somehow though Elle missed the sight of the day. A couple passed us driving a three-wheeled motorcycle (one in front, two in back) with a trailer. In the trailer was a big dog who seemed quite pleased with the wind in his face. He was also quite happy to get to bark at Elle. She still missed it. Elle: The directions weren't directing us very well. There were a number of streets with the wrong name and even a missed turn. Luckily between the bike computers and our phones we were able to find the turn-around. Soon after that, Webb got a flat. I took the opportunity to practice changing a tube. The tube wouldn't fit in right. Webb thought it might be a good idea to give the tube a bit more air to give it more shape. It turned out our air cartridge holder is rusted and broken. Webb: The C02 cartridge adapter was very frustrating. Part of it had rusted, but more maddening was that the interface thingy insider where the cartridge is punctured had bent or shifted or something. The result is that when you screw in the cartridge it doesn't seal properly so air starts shooting out. After blowing through 2 cartridges we were down to our last one, so I just went with it and was able to get it on the valve stem quickly enough to get an adequate amount of air into the tube. It worked, except the tire did not mount properly so I sorta thumped down the road. Annoying and yet still preferable to walking 25 miles. Elle: After we got the tire situated, I tried to put everything away in my bike bag, when the zipper broke. Were things taking a turn for the worse? Elle: On the way back I was getting more and more spent - perhaps we started out too strong on this 'easy' training ride. Then the directions really sent us packing. We ended up going off course, and of course it was up a major climb. We got to the bottom of the hill and realized we had gone in a big circle. Awesome. Now it was getting late. We were both out of water. We had been out for over 4 hours in 90-degree weather. And the lot where our car was parked closed at 7pm. We had less than an hour, otherwise our car would be locked in the park. We had an idea of how to get back, but we weren't positive, so we stopped a few times to check our phones. At one point, Webb was convinced we were on the right track and just needed to get going. Webb put the gas on. 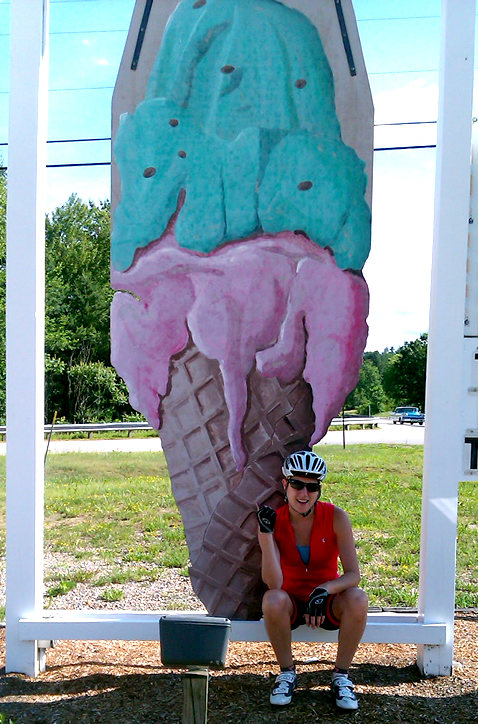 I had trouble keeping up, but the road looked familiar and then I saw the ice cream/seafood shack we saw on the way in. I looked down, my Garmin read 56.6 miles. We now had about 15 minutes until the park closed. How far away were we? Not quite sure. Anyway, I was done. I told Webb to go ahead without me (I was slowing him down anyway). He could get to the car before the park closed, then come pick me up. I was not feeling happy. I think most of it was mental, due to the bad flatting situation, then getting lost, it was getting late. I kind of gave up. Plus I had needed to use the bathroom for awhile. So I went inside, washed my face in the bathroom, which was nice, ordered some food and a vanilla shake and sat down. Once I ate something and replenished some fluids, I started to feel a lot better. Webb: Meanwhile, I was in time trial mode. I was pretty sure I only had about 3 miles to go in just under 15 minutes. Normally that would not be a problem; however, you might recall that there is a hill right out of the gate. I would have to climb that and descend the other side to get to the park. I hammered it. At one point I saw a sign that said I had 1 mile to go. I told myself, "destroy yourself here - 3 or 4 minutes of Hell. Whatever. Just get to the car." I pushed myself up the hill, pressing and pressing myself as hard as I could. About 100m from the top, I cracked. I changed my focus to "just keep the pedals moving and try to descend as quickly as possible." With some effort at the top I began to pick up the pace to carry some momentum into the descent. I then tucked myself in and pinned back my ears. I saw the gates were still open at the bottom (whew!) but remembered I had to get the car out of the park. I figured I would ride over to the park attendant and beg for a minute or two. No one was there. A good thing or bad thing? With no time to ponder that question, I popped over to the car and saw I had 6 minutes - enough time to rack the bike and even do a quick wardrobe change. I then drove quickly to the ice cream shop. I did not like the way I left Elle. It is not so much because it was a harder day than planned, as it she was just she seemed so unhappy. I parked the car and found her inside smiling with her shake and looking as if she had not just been on a bike for 4 hours. Wow, she recovers well. Elle: This all probably would have gone down a lot nicer if only we had planned better. Next time: get there earlier, park outside of the gate, get the right directions!